We're less than one month away from Star Wars: The Force Awakens making its home video debut on Blu-ray, DVD and Digital-HD. Yesterday, LucasFilm and Disney announced the big release, teasing all of the special features that we'll be getting. While we know that there will be several deleted scenes, the initial press release does not reveal what they are. Now, thanks to JBHiFi, we know what we can expect. While it was previously reported that there would be 7, possibly 8, deleted scenes, we're actually getting a few less. According to this latest report, there will only be 6 deleted scenes included with the main Blu-ray and DVD release. And some of the deleted scenes we've previously heard about aren't included in this initial line-up. The first deleted scene is called Finn and the Villager, a title that possibly hints at a moment described in the official book adaptation, which happens before Finn meets Rey and BB-8. The moment finds the AWOL Stormtrooper hitching a ride with a local into town. It's also speculated that this might be an extended scene from the opening act in the movie, where Finn refuses to kill the family in Lor San Tekka's village. The second deleted scene is simply titled Jakku Message, and we have no reference to what this particular deleted scene pertains to. Some believe it shows Poe calling the Resistance base to let them know he has the data from Lor San Tekka. He then tells them that things are not going as planned. It is also speculated that this deleted scene may show additional Kor Sella footage. The third deleted scene is quite self-explanatory. It is titled X-Wings Prepare for Lightspeed. And we got a sneak peek at the fourth deleted scene in the Star Wars: The Force Awakens Blu-ray trailer that dropped yesterday. Titled Kylo Searches the Falcon, we get to see Kylo Ren hunting for Han Solo as he steps aboard the iconic Millennium Falcon. The fifth deleted scene will explain a toy we've seen on store shelves since Force Friday this past September. Titled Snow Speeder Chase, we'll finally get to see the new vehicle in action. The final deleted scene hints that we'll see more of Finn after his deadly confrontation with Kylo Ren. This final cut footage is titled Finn will be Fine. And now that you've read through all of them, you'll notice that some key moments are missing. Just before the Oscars, nominated editors Mary Jo Markey and Maryann Brandon revealed that there would be between 7 and 8 never-before-seen deleted scenes from Star Wars: The Force Awakens. But none of what they have described is included here. They claimed that we were getting a new scene with Harrison Ford's Han Solo and another featuring Rey. None of these listed hint at that. 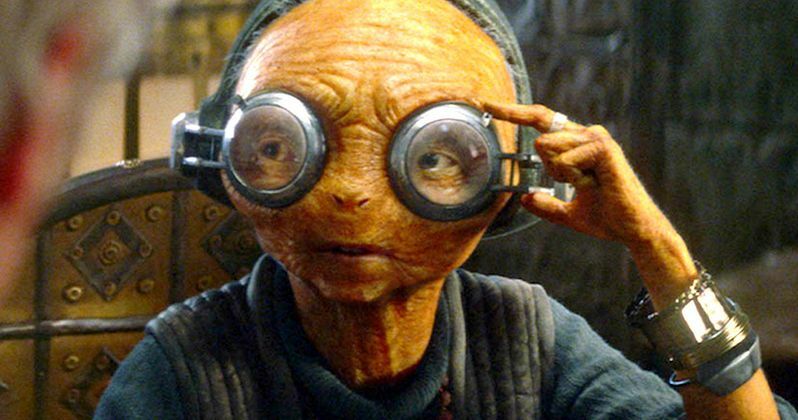 Other missing scenes that were expected includ a moment between General Leia and Maz Kanata back at the Resistance Base involving Luke's old blue lightsaber. And there is a missing scene where Maz squares off against Stormtroopers at her castle. Possibly the coolest missing deleted scene has Chewbacca ripping off the arms of Unkar Plutt inside Maz's castle when the Jakku junk boss comes to collect Rey.There is also a missing scene with Constable Zuvio, but perhaps that absent character will show up in the Jakku Message or Finn and the Villager deleted scenes. It's also possible that these missing deleted scenes are being spread out amongst the many exclusive editions of the Blu-ray and DVD that are coming to various retail outlets. We know that the Target version of the home release contains an addition 20 minutes of footage that won't be available anywhere else. And there will surely be more exclusives announced as we get closer to the April 1 release date.